Might be decent to run 1x in wild shudderwock. Not sure if wild shudderwock is a thing though. Not sure what sort of situations this will be useful in yet, but a decent tech. I'm gonna go out on a limb and say there will be some cards in RotS that make strong use of the Hero power or have some pretty high impact spells. I feel like this is a few expansions too late. Would have been useful when Highlander Priest and Tempo Mage were around. 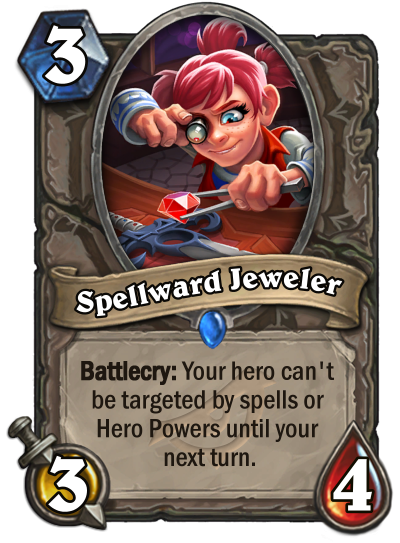 It's a nice pseudo Ice Block against combo decks that want to kill you by throwing spells to the face. Kobold Monk didn't see any play and it was more durable. I know, that the gnome's battlecry effect makes sure you are untargetable even if the minion dies (which wasn't the case with the kobold), but still. For me it's a tech card, which is useful in fringe cases. Much better than the kobold, it's less awkward to fit into a deck plus the effect is guranteed. Good on metas where burn mage is dominant or any malygos deck as well. Tech wild card. Good arena card. Also does this count DIE INSECT ! dr boom 1Dmgtoall ! and hunters shot ? Kobold Monk is much more better than this minion and it saw no play. I am safe to say that this minion will see no play either. I hate to be so grim but I love Kobold Monk's concept but it was just easily dealt with. The effect is ultimately isn't strong enough to be a factor. If we live in a burn meta, this could see play. We've had a lot of 3 mana 3/4s lately though, and none of them really took off. I don't expect this one will, either. Those are random, not target-able. This does offer some minor disruption against Combo decks, but only certain combo decks. Out of decks that may exist after the rotation, this will only stop Malygos and that meme Shirvallah + Holy Wrath deck. This won't stop Mechathun or any combos dealing with charge minions like Leeroy. I don't know about all the decks in wild, but the only other deck this can stop that I can think of is Exodia Mage. The only other use I can think of for this card is maybe as a Time Out lite for non-Paladin combo decks. As long as your opponent doesn't already have lethal on board (or from charge minions or non-targeted damage) you might gain yourself another turn to get the last piece of your combo. But even in that case it feels kind of weak to me.